Click the “2020 Catalogs” button under the brand you wish to download. 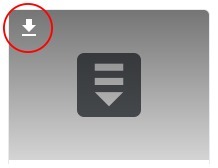 Click the download arrow on the upper left of the file. If using Google Chrome, the file will download to your download folder. If using Internet Explorer, you will be asked where you want to download the file. You may need to allow popups if you have a popup-blocker turned on. If this is the case, allow popups for this site and then retry your download.